Looking for a restaurant-style appetizer for your next get-together? Our Greek Flatbread Appetizers are a must try. 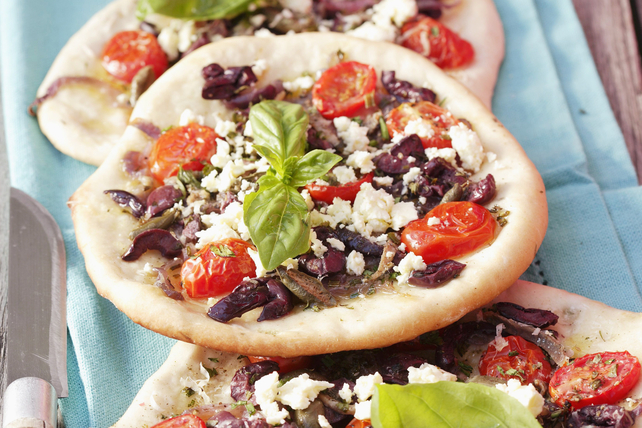 This tasty flatbread features crumbled feta cheese, Kalamata olives, blistered grape tomatoes, Greek feta dressing, and fresh basil leaves. A delicious combination! Place naan breads in single layer on baking sheet; set aside. Toss tomatoes and onions with half the dressing in shallow baking dish sprayed with cooking spray. Bake 15 min. or until tomatoes begin to blister, adding breads to the oven for the last 5 min. Add olives and remaining dressing to tomatoes; mix lightly. Turn breads over; top with tomato mixture and cheese. Bake 10 min. or until edges of breads are golden brown. Top with basil. Cut each bread into 8 wedges to serve. Substitute pita breads for the naan breads. Mix 1 Tbsp. chopped fresh oregano leaves with the cooked tomato mixture before spooning onto the naan breads, topping with cheese and baking as directed.